If the title of this piece seems a little like I'm bragging, then, well, I can't really deny that. But this is one of those instances in life that just feel like you have to make a big deal about, else they just get lost in the current with the rest of daily life. Regular readers will know that I've been after the sub-40 minute 10K race for a long, long time now - and on Sunday I finally did it in London's Kew Gardens, and all thanks to some subtle training tweaks that were enabled through technology. And, more importantly, Runner G completed her first ever race - getting people on the running train is way better than cracking times. When the third time of attempting to break the 2,400 second barrier in September 2014 yielded a 40.02 result, I knew something would have to change. I guessed my issue was I simply wasn't strong enough to keep my bag of muscles together in a straight line for long enough at the right speed. Cue tech to help. I tried the Wahoo Tickr X chest strap heart rate monitor and its 7 minute workout, which registered lunges, squats and planks and the Jabra Coach Crossfit plans - great, but too generic. Then I found a great eight week course online, with fortnightly YouTube training videos from Coach Jay Johnson - and that was a large part of it. They weren't hard initially, but focused on really pushing the hip mobility and strength, and as they ramped up, I felt looser than ever. I've already written about this at length, how this little Moov sensor has helped strengthen my calves through making me run at an insanely high cadence and coaching me to maintain the right form during the sessions. The epilogue to that is what intrigued me the most: I was just doing these sessions as a good way to vary the recovery runs, but I found that over five weeks I went from doing 6 minute kilometres at 190 steps per minute to around 4:40 - without much change in effort. I can't quantify the difference that made, but it definitely strengthened my lower legs and achilles - and helped me feel like my form was 'flowing' a lot more. I won't bore you with the excruciating details of this, but I did take on board a couple of things from the professionals I quizzed: taking a two day rest before the run (thanks Colin) and trying to structure the run in a way that broke it down a little bit better (thanking you, Dame Kelly). My plan was simple: try to hit each kilometre at a couple of seconds under four minutes, building a little buffer for the inevitable fall off the cliff towards the end (pace wise, not literally. I'm not that dedicated). My first kilometre was bang on - and that was with me having to pair some Bluetooth headphones and turn on Spotify on the go (as no sooner had I wormed my way towards the front of the pack did they say '3…2…1…go!'). While I usually don't run with music, this time I added in some theta-wave meditation sounds for the first half of the race, the same stuff they use to calm nervous flyers. The idea was to try and stay chilled for the first half, expending as little energy as possible. I ruined that as someone flew past me after the first kilometre, and I decided to stick to their pace for a little bit to make sure I hypnotised my brain into the faster speed. I hit a 3:47 kilometre and decided to throttle back, matching pace with those around me. That was pretty much how it went until 8.5km in - me and another chap sticking together, overtaking one another from time to time to keep the pace up. The Garmin chimed in with some lovely news every few minutes: I was hitting sub 4-min kilometres, and I could see I had built a lovely 19 second buffer over the 40-minute mark, according to the virtual pacer function on the Forerunner 920XT (a great tool I can't do without on races). Then we exited the river towpath back into the park - and that's where I came unstuck. Trotting over the newly mown grass was horrendous, the wet blades flicking up and landing inside my shoes, and my heart rate rocketed. I looked down and saw I'd lost four seconds in a few hundred metres, and I was in trouble. The finish line came into view, but we curved away, and I saw how far I had to go - a long loop over a field. My heart sank and my pace buddy started to pull away from me. I wanted to slow. I wanted it over… I was going to crash and burn again from my 40 minute challenge again. I kept churning over and analysing what I'd done wrong - I started too fast. I kept up too strong a pace. I rested too much. I didn't eat right. Whatever it was, I was dropping… my buffer down to 13 seconds. I had one weapon left: Bonnie Tyler. There's something about the place where the lightning splits the sea that fires my adrenaline, and I promised myself that I would do whatever it took to just get to the finishing straight. I pulled every trick I had: smiling, dropping my shoulders, pumping my arms, praying to whoever… and somehow I hit the finish straight with my 13 second buffer intact. My attempt at a sprint finish was woeful, and I even got passed on the line (which I blame Bonnie for - I couldn't hear a thing). But surely I'd done it! Around 39:47, right? What? How? What? Was the watch broken? Had I not done it? Did I stop it somewhere? I grabbed the guy I'd been running with, who'd finished five seconds ahead, and checked his time. '38:30' he grinned (turns out he'd never broken 40 minutes either). The Garmin had mis-tracked me (probably because we ran under tree cover for most of it). It was telling me I was going about 3% further each kilometre, and I'd pushed on as a result - so it thought I'd only done 9.72km. It doesn't get much better than that feeling. Actually it does.That first race sensation is hard to beat, and Runner G completed her first 10km run, the beam on her face as she sprinted across the line something I'll never forget. 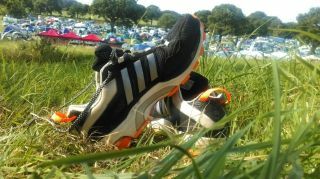 'To start, I couldn't even run for 10 minutes without needing to walk but was excited by my MiCoach plan and doing something 'worthwhile' rather than just eating and moaning all the time. 'About halfway through the three month plan, I started getting addicted to running kit. Running socks, wireless earphones, an armband that didn't slip off when I sweated and Spotify Running all became indispensable, as did the Adidas FitSmart watch, which made me take my heart rate during running more seriously – sharp exhales, trying to drop my shoulders and keep my head up felt more important than before. 'Then three weeks before the race, I picked up shin splints. My confidence absolutely plummeted. I had to take training breaks, I used a foam roller which hurt more than waxing (true story) and was in bits. I took the decision to see a physiotherapist, and that helped both phsychically and mentally. 'But where I had been so excited halfway, feeling I would smash the race, the week before I suddenly just didn't care anymore. I felt stressed, weak, tired and unprepared even though I'd be training for months. This was the lowest point. 'I did manage to do 8.5km the week before and after that I definitely believed in myself again. I just struggled to tell myself that what I was doing is actually something a lot of people struggle to do and I should be proud whatever the final result. 'I was tired after about 10 minutes and was desperate to walk. Everyone started off so fast and I was panicking - what if my shin splints got worse and I had to crawl over the line? What if there was dog poop on the line? 'Then…everyone around started to walk and I couldn't believe it! It made me feel stronger and a tad smug. My one goal for the race (apart from to finish it) was not to walk, telling myself: whatever happens, just don't walk. 'With a good country-music based playlist, by 8 kilometres I still felt good. I was nearly finished and while my right leg had gone numb, my time was OK - still on to beat 1hr15. 'But then came the horrid part: we had to run away from the line in order to lap round and finish, which was horrid. The sun was blazing and I was tired. My heart rate was through the roof. 'I slowed down but when the finish line came into view I sprinted: I wanted my time. I couldn't feel my right leg at all but by the time I crossed the finish line and calmed down a bit (and had a little cry on my friend's shoulder) I felt an overwhelming sense of achievement. And I'd done it in 1hr 14:36!